Purple Bubble is Hannah Chesterfield. That’s me. 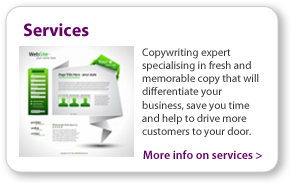 A refreshing and bubbly copywriter, with a creative flair offering a range of expert copywriting services in Devon, Dorset, throughout the UK and beyond. More descriptively, I am a content writer for websites (primarily) and a SEO copywriter...the copywriting game is very important to me. Whatever the task, I aim to please. From the very beginning, I want to deliver more than just words (albeit great words!) on a page. Establishing your tone and company's direction helps me to devise a plan, create memorable content and deliver exactly what you want and need, each and every time. My passion for words means that by asking questions I continually push for excellence in all that I do, helping me to help you. After six long years of studying part time with the Open University I graduated in 2011 with BA (Hons) in English Language and Literature, gaining a 2.1 (why not add that in? I did work my socks off after all! ), highlighting my hard working ethic, self motivation and excellent time management skills. 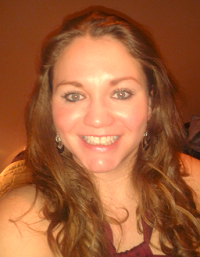 Being able to excite, entice and inform is something rather special and with my degree and previous experience as an assistant editor for an online magazine in Devon under my belt, Purple Bubble Writing was established. 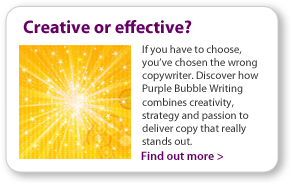 With this wealth of experience and natural flair, Purple Bubble Writing aims to help individuals and businesses, both online and through traditional methods, to enhance their written message and communicate more effectively through words. Take a look around my website, and if you think I could write copy for your business, please feel free to get in touch. I would love to hear from you.